Start heating the oil on high heat in the saucepan or fryer. Put the flour, egg yolk, and salt in the mixing bowl and whisk well. Continue to whisk while gradually adding the beer, until you get a smooth batter. 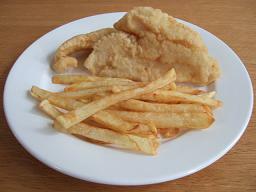 Put a little plain flour in the shallow dish, coat the fish fillets in the flour one at a time. When well coated with flour, dip each fillet into the batter, ensuring they are covered. As soon as each fillet is properly coated, drop it slowly into the very hot oil. Cook for 5-10 minutes or until nicely browned (remember, the thicker the fillets / steaks, the longer they will take to cook). Remove using a slotted spoon and drain immediately on kitchen paper. Pre-heat oven to 190°c / 375°f / Gas Mark 5. Heat the olive oil in a saucepan and gently fry the onions until they are soft. Add the garlic, chopped tomatoes, and black pepper and stir well. Simmer for about 15 minutes, stirring occasionally. Peel and finely slice the mushrooms and add to the tomatoes. Stir in the olives and basil. Lay the fish in the roasting dish and sprinkle lemon juice and pepper over each fillet. 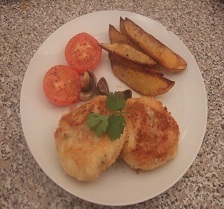 Spoon the tomato sauce onto the fish fillets. Cover with foil and bake at the top of the oven for 20-25 minutes. 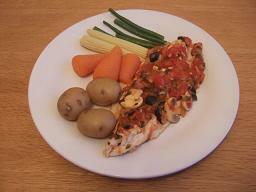 Serve with baby vegetables and new potatoes. Peel and halve potatoes and boil until soft. Peel and chop onions finely and fry in olive oil until soft. Finely chop the garlic, add to the onions and sauté for a few minutes. Check fish for bones by running your hand over the fish. If you feel bones, pluck them out, either with your fingers or a pair of tweezers. To remove skin, place the fish skin side down on a board. Using a sharp knife, and holding the tail end, cut through the flesh, close to where you are holding it, but not through the skin. Holding the knife at a 75° angle, pull the tail towards you while moving the knife gently side to side. The skin should come away from the flesh easily if the fish is fresh. Cut the fish into small cubes and place in the glass dish, sprinkle prawns on top. Pour onion and garlic mixture over the fish. For the white sauce, put all the ingredients in a saucepan over a medium heat. Whisk gently until the butter has melted. Now using a wooden spoon, keep stirring until the sauce has thickened nicely. Pour over the fish and onions. Mash the potatoes with a little butter and milk and season well with pepper. Spread over the sauce and fluff the top with a fork. Sprinkle over the rest of the grated cheese and more black pepper. Bake in centre of oven for 40 minutes. Peel and cut the potatoes into 2.5cm / 1" cubes. De-seed and cut the pepper into 1cm/½" squares. Fry the onions, potatoes, and peppers in the saucepan over a medium heat for 10 minutes. Peel and finely slice the garlic. Add to the saucepan and fry for 1 minute. Add the tomatoes, wine, and hot water. Crumble in stock cubes and add Italian seasoning. Simmer for 20 minutes or until potatoes are tender. 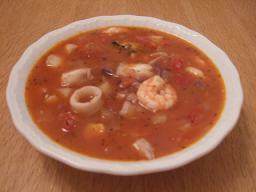 Cut the fish into 2.5cm / 1" cubes and add with the seafood and pepper to taste to the saucepan. Preheat oven to 200ºC/400ºF/Gas Mark 6. Remove skin from fillets and ensure there are no bones. Divide pastry into 4 portions. Roll out 1 portion of pastry until it is large enough to completely enclose 1 fillet and trim off any excess. 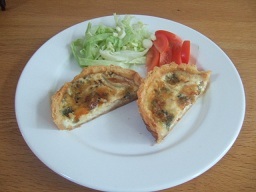 Place fillet, skin side up, in the centre of the pastry. 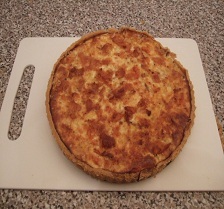 Brush the edges of the pastry with beaten egg then fold the pastry over to make a parcel. Place parcel on the baking sheet, skin side down, and brush with beaten egg. Repeat this process with the remaining pastry and fish. Place in the oven for 40-45 minutes or until the pastry is golden brown. Serve with seasonal vegetables or salad. Chop onions finely and fry gently in the olive oil until softened (if you do this with a lid on there is less chance of burning). Peel and finely chop the garlic, add to the onions with the rice. Sauté until the rice is opaque. Dissolve stock cubes in hot water and pour over the rice. Add the saffron, and stir well. Cover and simmer for 15-20 minutes or until the rice is nearly cooked. Peel, de-seed, and finely dice the tomatoes and add to the saucepan. 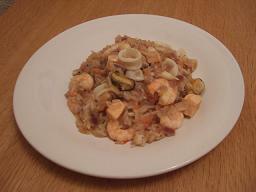 Cut the fish fillets into 2.5cm/1" cubes and add to the pan with the mixed seafood and prawns. Fish will cook in 1-2 minutes. Season with plenty of black pepper. Grease tin well with butter. Roll out pastry to 3mm / 1/8". Line flan tin with pastry, pressing gently into corners, trim off excess. Prick pastry with a fork but be careful not to go all the way through. Cover pastry with baking paper and pour in baking beans. Bake at the top of the oven for 20 minutes. While pastry is baking peel and finely chop onions. Fry onions in olive oil until softened. Peel and crush garlic and add to onions. Stir for a few minutes then remove from heat. 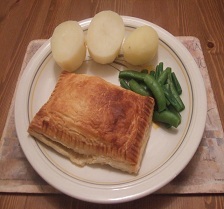 When the pastry is cooked, remove the baking paper and beans and spread the onions in the base. Cut the salmon into 2.5cm / 1" pieces and sprinkle over the onions. Beat the eggs with the milk in a small bowl and pour over the salmon. Grind some black pepper over the top and return to the top of the oven. Bake for 45 minutes or until lightly browned on top. 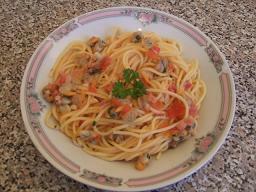 Cook the spaghetti in lots of boiling water with 2 Tbsp of olive oil, then drain well and set aside. Peel and finely chop onions and chilli. Heat 2 Tbsp of olive oil in the saucepan and fry the onions gently until soft. Add the tomatoes, garlic, chilli, white wine, lemon juice, stock cube and black pepper to taste. Cook gently for 30 minutes. Add the cockles and parsley to the tomato sauce and cook for a few minutes and stir well. Mix the pasta into the cockle and tomato sauce. Peel and boil potatoes until soft. Steam the fish over the potatoes. When boiled, drain and mash the potatoes using a little butter. Break up fish into approximately 1cm / ½” pieces. Mix together the fish and potato. Cut prawns into 1cm / ½” pieces. Add coriander, prawns and pepper to fish mixture and mix well. Add enough egg to bind the mixture together and make it mouldable. Shape mixture into 8 balls and flatten to 2cm/1” with a fish slice. Coat each cake with flour then with beaten egg. Fry the cakes until they are brown on both sides. Cut the aubergines in half, score with a sharp knife and brush with 1 tablespoon of the olive oil. 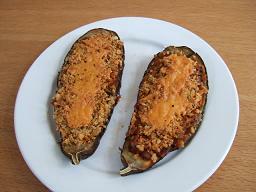 Place the aubergines in roasting dish in the oven for 20 minutes. Chop the onions and fry over a medium heat in remaining olive oil in the small saucepan, until soft. Finely chop the garlic and add to the onions (keep the lid on). Finely dice the tomatoes and add to the onions and garlic. Finely dice the mushrooms and add to the pan. Add the tomato puree, herbs and black pepper, stir well and turn the heat off under the pan. Remove aubergines from the oven and scoop the centre into the pan. Mix up the ingredients and refill the aubergines. For the topping melt the butter in the frying pan, turn off heat and add the breadcrumbs stirring well. Place this on top of the filled aubergines and cover with the grated cheese. Return to the oven and cook for a further 20 minutes. Just double the ingredients for a meal for four. Preheat the oven to 220°c / 400°f / gas mark 7. Cut the cauliflower into florets and wash.
Pour boiling water into the medium saucepan and put the steamer on top. Add cauliflower florets and cover with a lid. Let florets steam for about five minutes (we want them fairly firm, so don't overdo the steaming). Drain florets and put aside. For the cheese sauce, put flour, butter and milk in a saucepan over a medium heat. Using a wooden spoon, keep stirring until the sauce has thickened nicely. Add the cheese (saving a little for topping) and stir until dissolved. 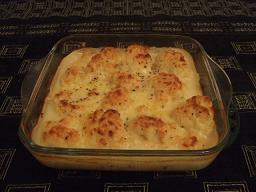 Place the steamed cauliflower florets into the glass dish and cover with the cheese sauce. 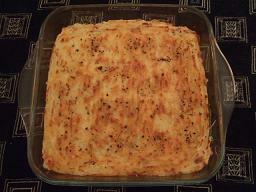 Sprinkle remaining cheese and some black pepper over top and bake in center of oven. Cook until topping goes golden brown (about 20-25 mins). Reduce oven heat to 150°c/300°F/Gas Mark 2. 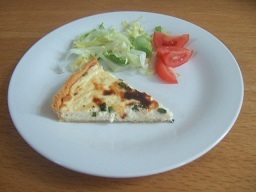 Spread the cheese and chives in the cooked flan base. Beat eggs and yolks, add milk and fresh black pepper. Pour mixture into flan, up to ¾ full saving the rest for later. Place flan in centre of oven for 15 minutes. Add rest of mixture and cook for 30-40 minutes or until firm. Peel and finely chop onions, fry until soft. Peel and finely chop garlic, add to onions. When the potatoes are cooked, drain and return to saucepan. Add the cheese (saving a little for the topping) and onions including oil the onions were fried in. Mash with a little butter and milk. Transfer to the glass roasting dish, then spread evenly and fluff the top with a fork. Arrange slices of tomato on top and sprinkle over remaining cheese. Grind a little pepper over the cheese. Place at the top of the oven and bake for 20 minutes or until nicely browned. Boil the macaroni in the large saucepan for 10-15 minutes. Put the butter, flour, milk, mustard powder, and black pepper in the medium saucepan. Place on a medium to high heat and whisk continuously until the butter has melted. Now using a wooden spoon, stir until the mixture has thickened. 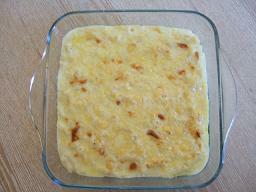 Remove from heat and stir in the cheese, saving a small amount for the topping. When cooked, drain the macaroni well then add to the sauce. Stir well to coat the pasta then pour into the ovenproof dish. Sprinkle over the remaining cheese and grind a little extra black pepper over the top. Grill under a high heat until the cheese has browned. For a really creamy sauce substitute 140ml/5floz of the milk with double cream. Place the dried mushrooms in a bowl and cover with hot water. Pre-heat the oven to 170°c / 325°f / Gas Mark 3. Melt half the butter with the olive oil in the saucepan over a low heat. Add to the saucepan and fry with a lid on until soft. Peel and crush the garlic, add to the pan. Drain the mushrooms, saving the juice (try not to include the grainy bits at the bottom). Chop the mushrooms roughly and add to the onions. Crumble the stock cubes into the mushroom juice, add the Italian seasoning. Top the liquid up to 1 litre / 2.2 pints, add the wine and pour into the saucepan. Place in the oven and cook uncovered for 20 minutes. Wash, trim and slice the mushrooms. Using the remaining butter sauté the mushrooms in a small frying pan until golden. 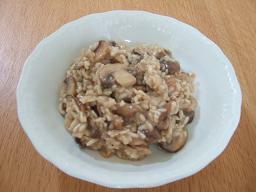 Add the mushrooms to the risotto and return to the oven for 10 minutes. The rice should be tender with only a little liquid remaining. Fold in the grated parmesan and leave to stand for 2-3 minutes with a lid on. (if you do this with a lid on there is less chance of burning). Finely chop the garlic and add to the onions. De-seed and chop peppers into 1cm/½" squares and add to saucepan. Add tinned tomatoes, stock cubes, tomato puree, black pepper and herbs and simmer for 10 minutes. 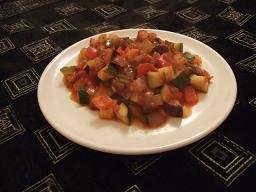 Dice Aubergine and courgettes into 1cm / ½" squares. Add Aubergine and courgettes and simmer for further 25-30 minutes till all vegetables are al denté. 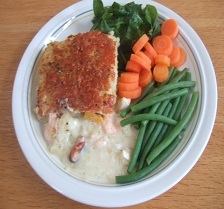 Serve with boiled potatoes and/or seasonal vegetables. Fry onions in olive oil until caramelised. Spread onion and stilton in the base. Put rice in large saucepan and cover with water. Chop onions finely and fry gently in the olive oil until softened (use the lid). Finely chop garlic, chilli (if using), and ginger and add to onions. Peel and cut potatoes into 5cm /2" cubes and boil in the large saucepan. When potatoes are almost cooked remove from heat, drain and allow to cool. Peel and slice the carrots. Add carrots and curry paste to the onion mix. Stir to coat all ingredients. Turn heat to low, pour in tinned tomatoes, black pepper and half of the coriander and stir well. Allow to simmer for 30 minutes with a lid on. Add coconut if using and stir until dissolved. Dice and add the aubergine (eggplant). Cut the broccoli into florets and add. Add more coriander, saving a little for garnish. Peel and quarter the mushrooms and add with halved fresh tomatoes, sugar and the yoghurt. Simmer for a further 30 minutes. Top up the water in the rice and put on to boil. When the rice is cooked, drain in a colander and pour over a kettle of hot water. Serve the Balti with the rice and garnish with the remaining coriander. If the curry tastes a bit harsh add some more yogurt to mellow it. 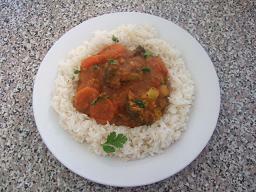 If your preference is for a slightly sweeter curry add a bit more sugar or tomato puree.